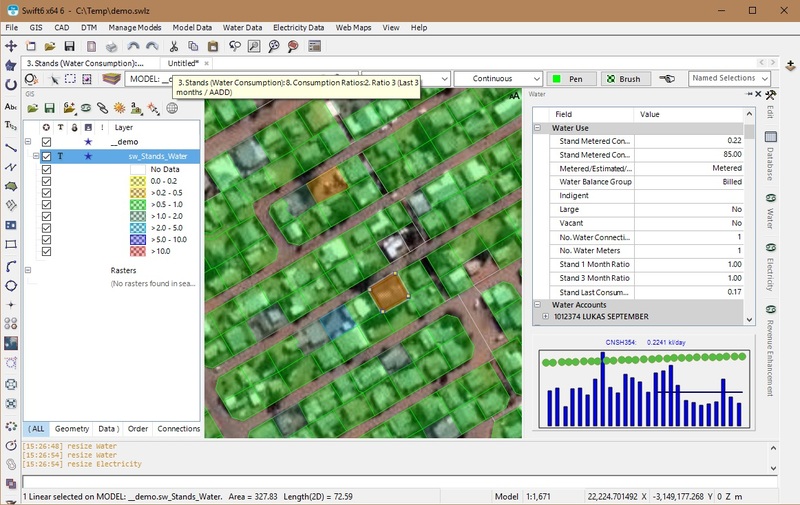 Swift is a computer program that performs statistical analyses of data in municipal billing databases and provides important information to the Municipal Infrastructure Manager. It also provides a link between the sewer and water distribution models for accurate modelling of the water demand or effluent production. In the quest for a water service provider to optimize the service to consumers in terms of providing sufficient water at an affordable cost the need for accurate information about the system is becoming ever more important. This information is in fact available in Municipal Treasury Databases where the readings for every water meter in the system are stored on a monthly basis along with land use and other stand related information. The problem is that the treasury systems were not designed to produce the information and statistical reports required by the infrastructure managers. The data is also not spatially referenced, which would allow links to cadastral database applications in GIS. It is therefore necessary to extract the information from the databases and use additional manipulation through software designed for the purpose, to perform the required statistical calculations. Although the calculations needed to produce the information are theoretically simple, the volume of data that is involved makes it difficult to use spreadsheets. Even in relatively small towns, where there are less than 15 000 stands, it has been found that spreadsheets become prohibitively inefficient and clumsy. In addition a user-friendly query builder allows the system manager to perform any further queries on the data that may be required. The Swift databases are obtained from the relevant authorities' treasury databases. As such Swift includes data for every stand and every meter in the study area. Fields in the databases include information on stand related data such as the owner, consumer, address, landuse, zoning, consumption and tax tariffs of the stand. The value of the stand and any improvements are also included. Information related to the meters includes the meter readings, the meter serial numbers and the date of installation. This information is available to the user in a seamless structured data table and can be sorted, queried and saved in reports as required. It is also possible to separately view the data and a graphical display of water consumption for each user. During the course of various studies it has been found that it is important to validate the historical meter records extracted from the treasury systems. Routines are required to identify and correct irregularities in the water meter readings such as sudden drops in the readings when a meter is replaced, spikes and/or dips in the water consumption records and unrealistically high or low readings. Possible causes for these errors include both faulty water meters and data capturing errors. There are also basic functions to check the integrity of the latest readings against the historical meter records. 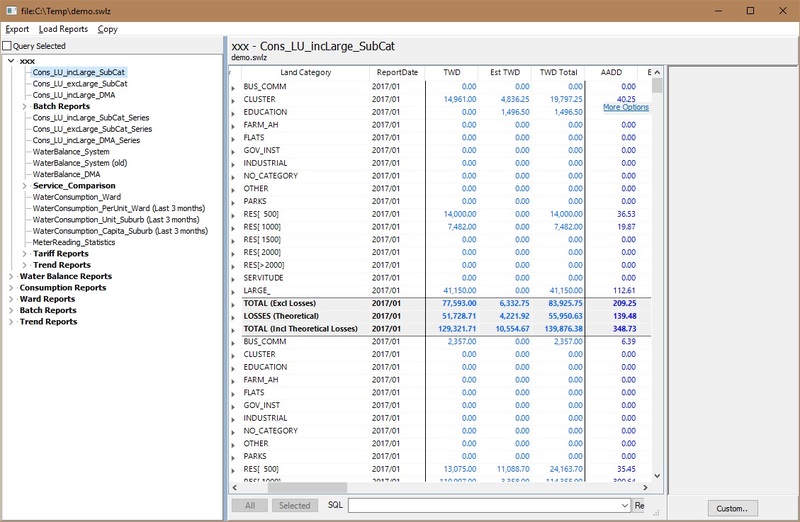 Swift allows the user to customize certain settings so that the analyses can be performed for any treasury database. For example what might be considered a large consumer in one town would not necessarily be a large user in another, larger town. Swift allows the user to define the consumption that determines the large users. Similarly, the suburbs and land use information can be categorized into user specified groups so that meaningful results can be obtained for any system. Before the unaccounted for water in a system can be determined two things must be known: The amount of water being supplied to the system and the amount of water that is actually being consumed by the users within the system. Determining the supply of water to a system is standard practice and bulk water meters record the supply of water to different areas within the distribution system. The bulk meter readings are included in the Swift databases. These meter readings are grouped so that the total supply of water to discrete bulk meter zones can be calculated by adding the individual meter readings. The data in Swift includes individual water meter readings for each of the consumers in the system. Swift calculates the total water sold to each user. Each user is linked in turn to any number of bulk meter zones through a cross-reference table so that the total water sold within each bulk meter zone can be calculated. Comparing these totals to the total bulk meter input gives the unaccounted for water for the zone. A financial module was included in Swift to calculate the income through water sales. This module is particularly useful in determining the stepped tariff structure for water sales as the calculated income is based on actual water consumption data. Each metered record in the Swift database includes a code that defines the tariff structure against which the water consumption must be billed. Swift allows the user to define a tariff structure for each of these codes. The tariff structure describes the different steps in water consumption and the related charge per kilolitre of water. Fixed monthly charges can also be incorporated into a tariff structure. Swift then calculates the income through water sales for each of the records based on the assigned tariff structure. The water consumption, income through water sales and the number of users per step in each tariff structure is determined. This allows the user to easily assess the effect of changing the water consumption steps and/or the related tariff. Sewer tariffs can also be billed according to the water consumption. Swift can therefore also be used to calculate the income and tariffs for sewage discharge. 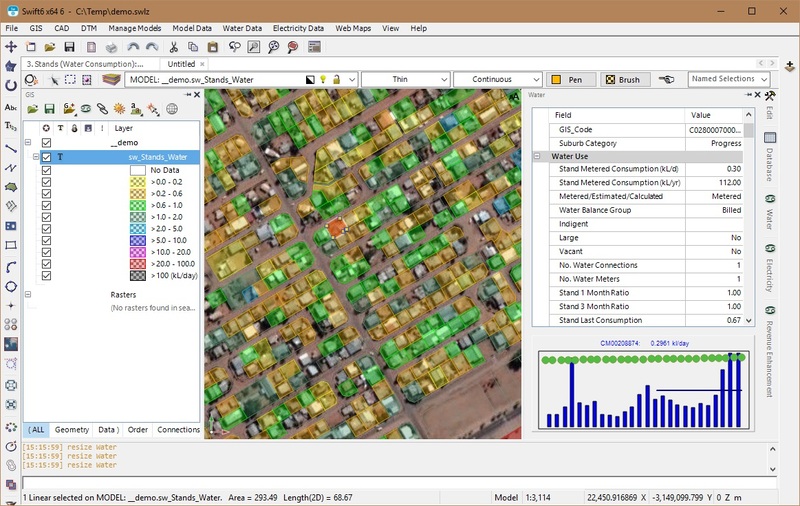 Water distribution models and sewerage system models(such as Wadiso and Sewsan respectively) can be linked to Swift by assigning every stand to the nearest node or manhole in the model. The models can then be automatically populated with accurate information derived from actual water consumption records for present day and various future development scenarios. If every record in the Swift database is linked to a graphical entity in the cadastral layout of the study area, visual queries can be performed on Swift 6. which now features the Albion CAD/GIS platform. These spatial queries produce thematic maps of, for example, land use, water use or large consumers. The benefits of these visual queries are numerous and provide important information for both the engineer and treasurer.